Very dark garnet. Strawberry aromas. Very sweet strawberry and raspberry fruit flavors, soft acid, moderate soft tannins, and long raspberry fruit finish. 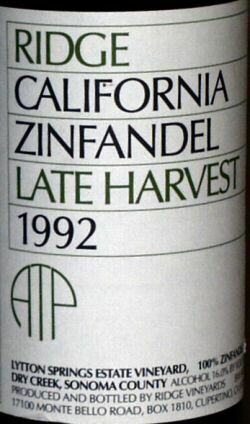 Although this Zinfandel has 16.0% alcohol and is very sweet with 8% residual sugar, I detected only a slight hint of over ripeness. I think I like the 1991 better. My rating 85.